CZ61: 8.08 Acre Farm mini farm property 1 mile from Progresso Lagoon! 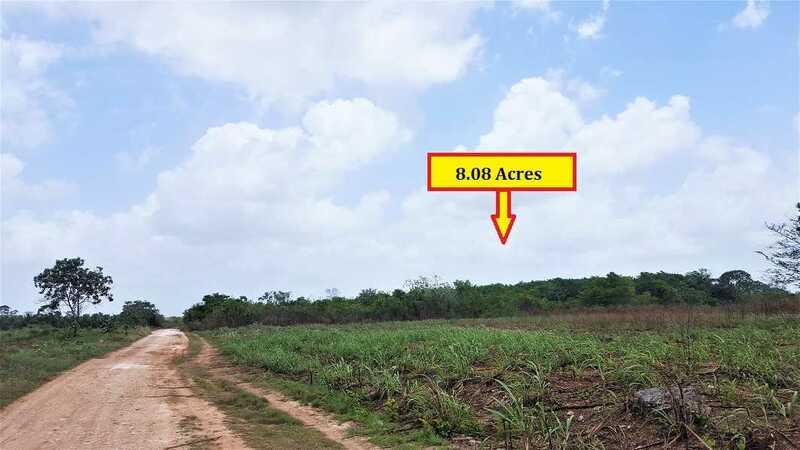 Farmland For Sale in Belize! 8.08 Acre Farm mini farm property 1 mile from Progresso Lagoon! Farmland in Belize for sale! Land For sale in Progresso Lagoon! Farm Belize for Sale! Looking for a property that is easily manageable to develop and maintain? This 8.08 acre property is situated approximately 0.9 miles from the heart of Progresso Lagoon Village in the Corozal District. This great mini-farm property can easily be converted into a residential estate with ample space for farming and building that home or mini ranch estate. The property is second growth and there is a mix under brush and trees on the property. The area is fertile, high and dry and there are few farm property surrounding this great 8.08 acres. Electricity is only half a mile away from the property and one must drill for artesian water well which would be anywhere from 50+ feet in depth. There is cellular signal and data connection as one can see the telecom tower that is located 1 mile from the property in the heart of Progresso Village from the property! The property would be approximately 21 miles to Orange Walk District or approximately 35 to 40 minute drive since the roads have not been paved in the area. There is still a plan for government of Belize and EUA to pave the road but has been stopped twice due to the contractors. Once this road is paved this will make the area explode! This property is definitely a little gem in the rough! Make an offer! << CZ60: Residential Lot in Finca Solana just couple of blocks from Sea!